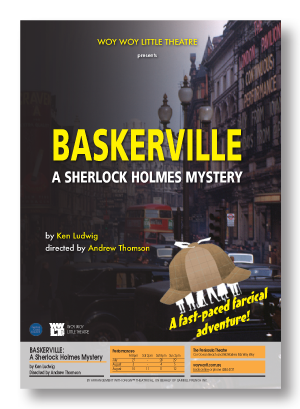 Get your deerstalker cap on — the play’s afoot! Sherlock Holmes is on the case. The male heirs of the Baskerville line are being dispatched one by one. To find their ingenious killer, Holmes and Watson must brave the desolate moors before a family curse dooms its newest heir. Watch as our intrepid investigators try to escape a dizzying web of clues, silly accents, disguises, and deceit as five actors deftly portray more than forty characters. Does a wild hellhound prowl the moors of Devonshire? Can our heroes discover the truth in time? Join the fun and see how far from elementary the truth can be. Fridays @ 8pm July 27, August 3 & 10. Saturday @ 2pm August 11. Saturdays @ 8pm July 28, August 4 & 11. Sundays @ 2pm July 29, August 5 & 12. Prices: Adults $30, Concession $25, Children up to 16 $8. BY ARRANGEMENT WITH ORiGiN™ THEATRICAL, ON BEHALF OF SAMUEL FRENCH INC. Opens Friday 27 July 2018.